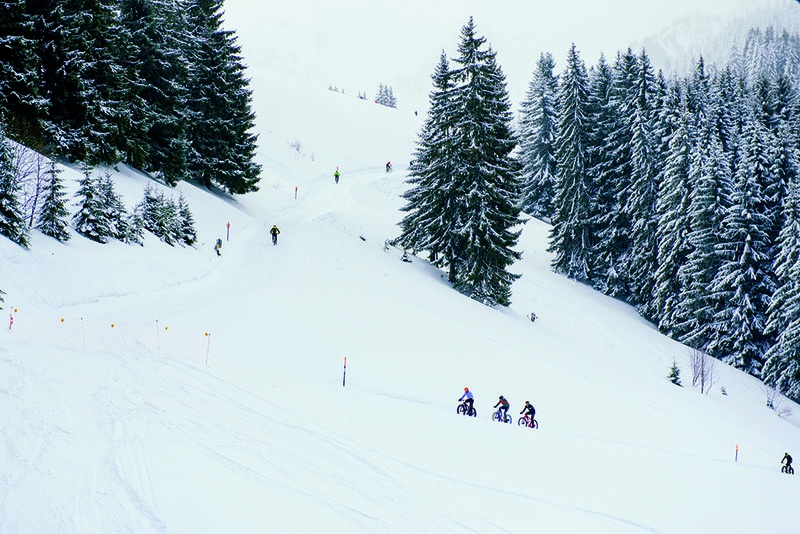 Whiteouts & Wipeouts At The Snow Bike Festival! 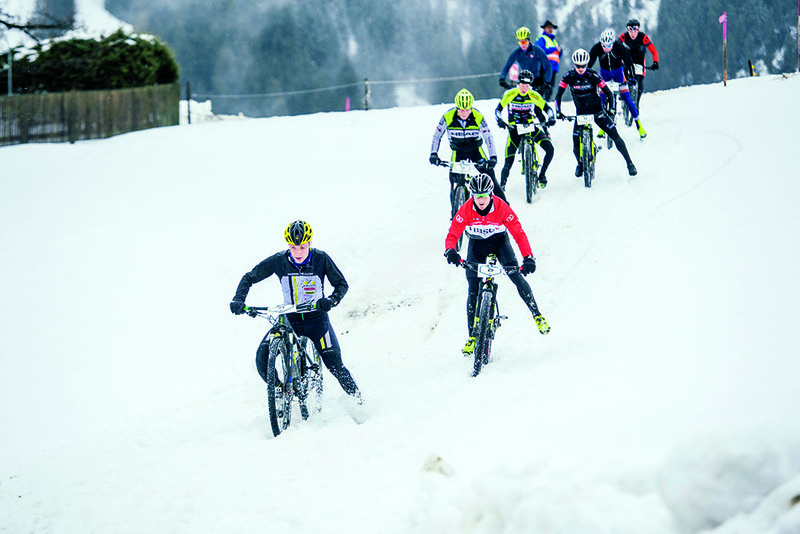 Sometimes the only way to survive the Snow Bike festival in Gstaad, Switzerland is to stop, have some chocolate – and only then carry on. After pushing hard on the pedals for the last 15 minutes, with only the briefest of glances to my right to look out over snow-covered pines towards an epic vista, I was nearly at the top of the climb. I’d promised to reward myself at the summit with a short rest and a chocolate-bar treat – if my snack hadn’t frozen completely solid in the sub-zero cold – and was already craving the sugar needed to give my ‘engine’ a much-needed boost. Eventually the gradient let up; the effort required to turn the crank returned to a more manageable level, and a blue sign popped against the whiteout of the snow-covered mountainside, to congratulate me and announce that the big climb of the day had been conquered. I kept my promise to myself, stopped pedalling, and rummaged around in my back pocket for the chocolate. My numb, cold-paralysed fingers were clumsily failing to locate it; but while I continued my hungry struggle, with no other competitors to be seen either behind or in front of me, I was blanketed in an immense and powerful silence. Stopping to eat a handful of chocolate? That’s not the way this would go down at home. When racing one of the many quality three-day stage races or Saturday-morning blitz missions back in South Africa, stopping is just not an option – I’m on the rivet for the full 60 to 100km. Wasting time for any kind of stoppage means sacrificing race position and time, and that doesn’t play favourably in my post-event analysis, bragging rights, or side bets with fellow riders. But 12 736km away, in the unfamiliar snowy surroundings of a different continent, and winding my way up into the Alps with not a soul around… all that urgency and manic ambition to finish the race as fast as I can has yet to make an appearance. This is no Mickey Mouse field, either. 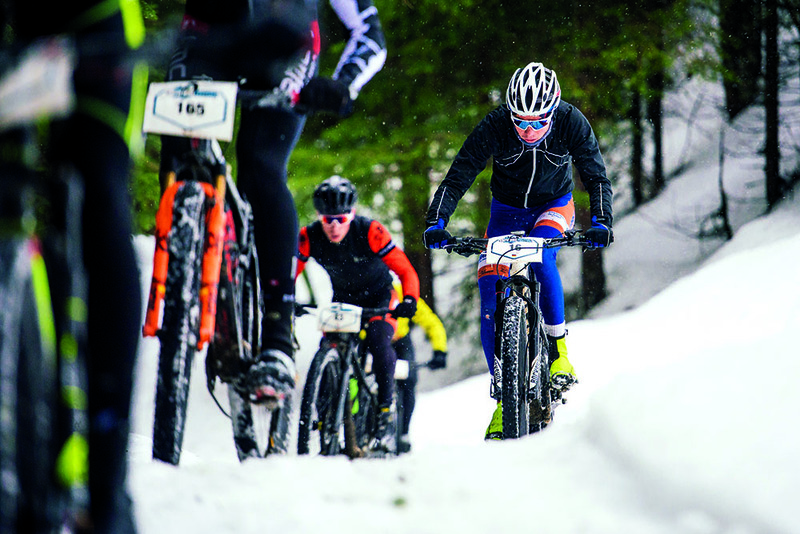 Now in its fourth year, the Snow Bike Festival has become a prestigious and novel opportunity to claim UCI points. This is not only important for the pros, who turn out to ride for team and personal glory; UCI-registered but non-professional riders also collect points throughout the year, allowing them to qualify for races that require a certain points total, and to measure their performance by competing against other registered riders. 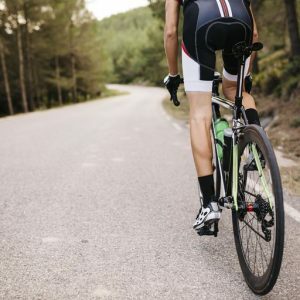 Sitting there alone, munching on three Swiss chocolate bars at once, I wonder to myself why I hadn’t been drawn into this pack of faster riders – why I had complacently decided to let the faster lot pedal away around the first few bends. I didn’t have to discipline myself to detach from the pace, either. No, this leisurely attitude was all-pervading. 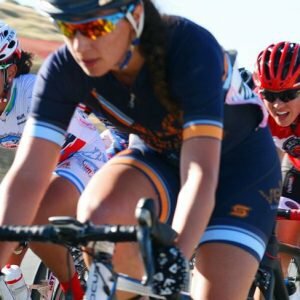 I was relishing delving deeper and deeper into the blissful experience of riding without having to chase the shallow and unfulfilling targets I normally set myself when entering a race. The fairy-tale surroundings, I think, have a lot to do with my changed attitude. This surreal white backdrop and most beautiful of landscapes, together with the utter quiet and bitingly fresh cold, are tweaking my senses in ways they aren’t used to – and thereby pulling my attention and energy away from a racing mindset and into that mindfulness space so often punted in self-help books and on social media, along with the notion of being present. Being present: taking in my surroundings with every sense; stopping at the aid station to eat my body weight in Swiss chocolate; noticing the icicles forming from my snot; complimenting the 70-year-old passing me up the climb on his on-point cycling pants (full-length Montcler waterproofs, in Vector Tartan); watching the excess snow flick off my bike’s 76mm-wide tyres; becoming aware of the size of the frost cloud blown from my lungs, reducing as the temperature increases from minus-10°C to minus-2; and knowing it’s 9am, not by checking my computer but by the clang of the bells in the ancient chapel steeple of a quaint mountain-top town. If this is what they’re talking about, then being present in a bike race has its merits – though not in terms of one’s proximity to the podium. 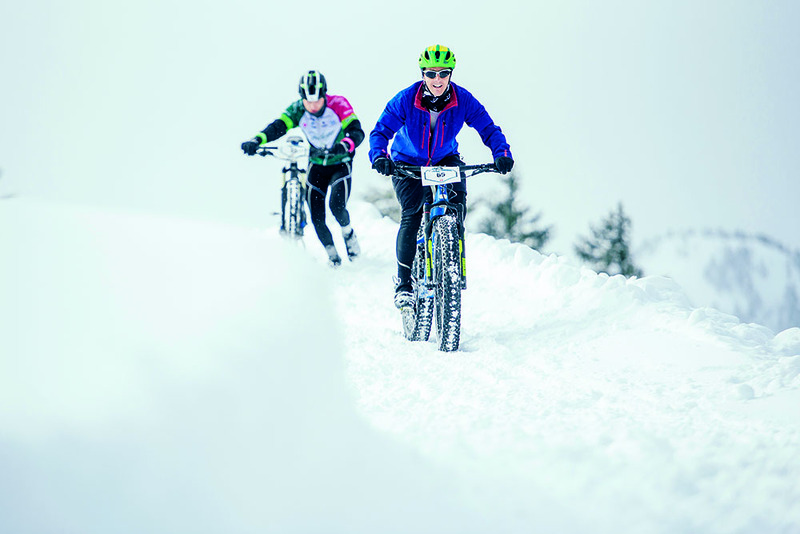 There’s more to competing in a snow bike race than just the ambience, though. Fortunately for me, being present seems to allow the technical aspects of riding in the snow to come to me more naturally. The more I engage with the environment, the more my skills seem to improve. Suddenly, in a mash-up of rutted and slushy downhill labyrinths, the strongest line to choose appears obvious. I realise I need to get low, bringing my body’s centre of gravity closer to the ground to be able to fly down the treacherous downhills. Zipping over the slippery ice without trepidation is a breeze. 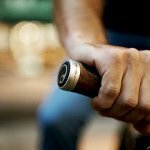 Squeezing the back brakes at just the right pressure, while simultaneously nudging the saddle to get the back wheel to move laterally into a controlled slide, works a dream. And perhaps most importantly, my ability to wipe out like a champion has been elevated to Olympic level. Letting go of the racing, and taking in this adventure for what it really can be, makes riding this event a cycling experience to rival any other. The exhilaration I feel after each stage is directly due to the surreal nature of this exquisite riding – and comes without the huge depletion of energy I’m used to in the hot, dusty rides back home. 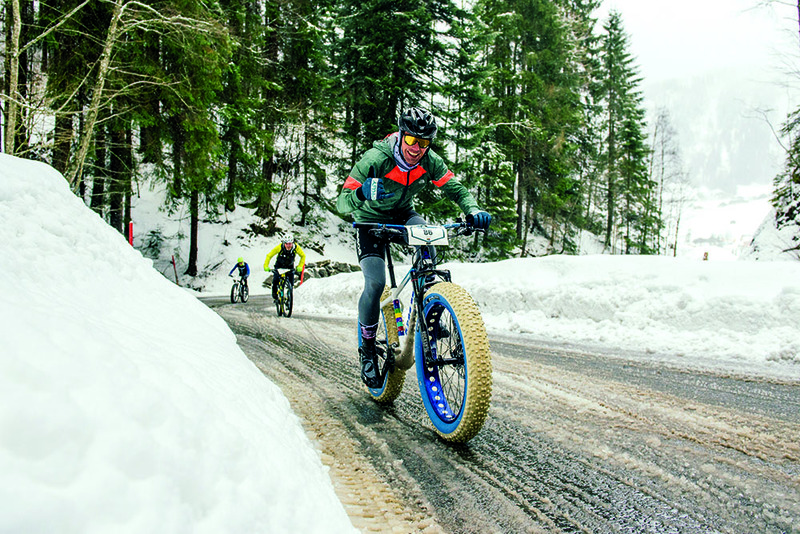 This is my third Snow Bike Festival, and my appetite to return is as voracious as ever. Travelling in Switzerland is a surreal experience in itself. Both summer and winter present a countryside that has seemingly just jumped straight off a postcard. In summer it’s all lakes, the greenest of green hills, huge, geometrically-pleasing barns, and XXXL-sized cows. Winter snow transforms the green to white; the cows retire to the barns, and are replaced by skiers on the slopes. Both seasons are best experienced by train – not just the most efficient transport system in the world, but bike-friendly too, and perfectly designed for staring out of the windows for the duration of your commute. Once in the mountains, some trains even have windows in the roof, angled to give the most efficient and panoramic view of the exterior. You can fly direct to Zurich from Johannesburg or Cape Town (the latter in our summer only, via Swiss-owned Edelweiss). Once there, it’s easy to choose a train to your next location. Arriving in Gstaad is also a fantastic experience. The open train station runs right next to an opulent promenade – a short street in the middle of the town where the richest of the rich expect to see the most ostentatious of brands available for their retail pleasure. Gstaad is famous for its wealthy and famous visitors and luxurious chalets, but prides itself on a relaxed vibe; everyone mixes without much star-struck fanfare. I didn’t notice DiCaprio or Madonna (two A-listers who visit regularly) on the start line of my race. Perhaps they were kicking back (not together, surely? #youhearditherefirst) in one of the many ultra-luxurious hotels in the area. Can’t blame them, actually. I stayed at the very attractive old-chalet-style but beautifully redone HUUS Hotel; and it took an effort to leave my sociable, warm and activity-packed residence to go riding in the freezing cold every day. 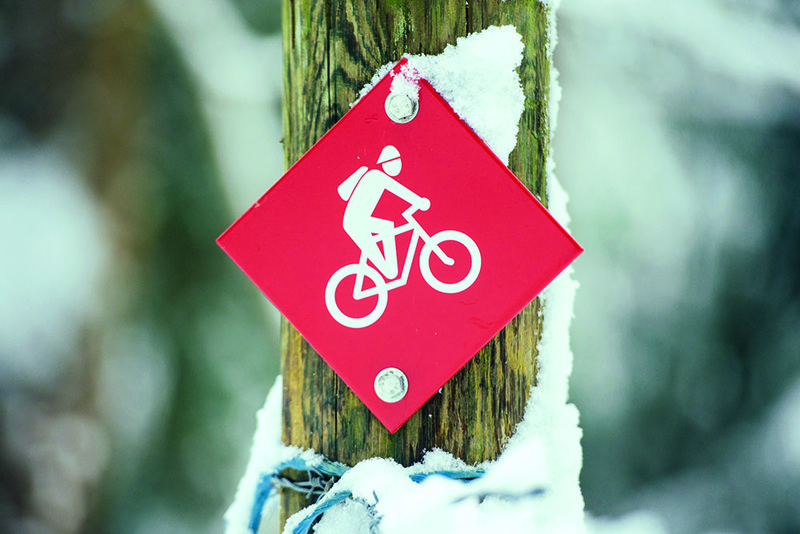 My regret would last just moments, though; once you’re riding alongside a raging river, through an ancient town, or up (or down) a frosted peak, the exhilaration of mountain biking in the snow obliterates any feelings of FOMO for other activities. 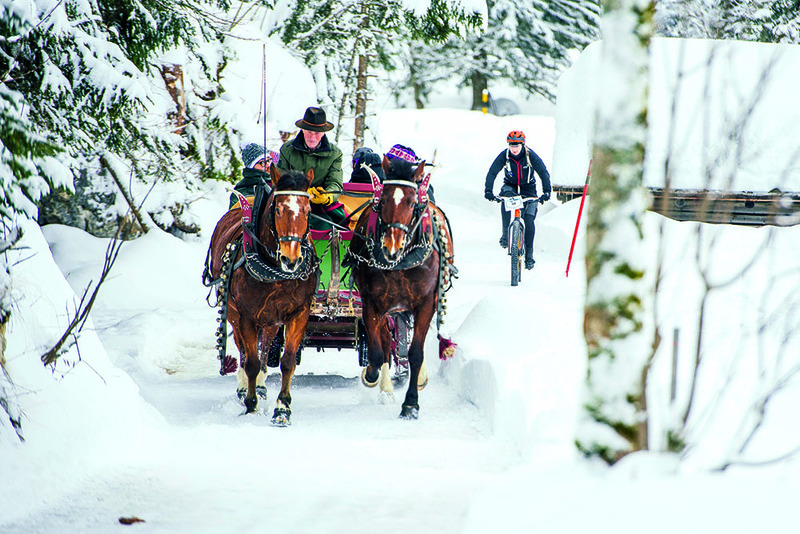 Gstaad has a lot to offer besides the obvious snow-bound adventures: hot-air ballooning, a variety of fondue experiences, a sports centre (with warm outdoor pools, and the strange sport of curling), horse-drawn carriage rides, and so much to explore. It’s an expensive location, but Gstaad Tourism has some great tips for affordable accommodation options (including sleeping in a barn, on straw beds! ).